I love how sunlight warms my skin. Seems to put everyone in a good mood, and it makes me hope that our long cold spring is finally coming to a close. I know that it’s supposed to start raining again in a few days, but I’m grateful to take this for now. Some of my very good friends had their tenth wedding anniversary last night. He arranged to rent Lola’s Room at the Crystal Ballroom, and had Art Abrams Swing Machine playing for the night. It was great fun to see all our old friends, to do a little swing dancing, and to realize also how we’re all ten years older. We looked at photos from the wedding, and I realized that back then I had been so preoccupied with my faults that I completely missed how uniquely beautiful I was. In these pictures I saw a beautiful, happy woman, and I wanted to go back in time to tell her so. Since I am not a time traveller, I can only remind myself that I am the same today: beautiful, loved, and joyful. 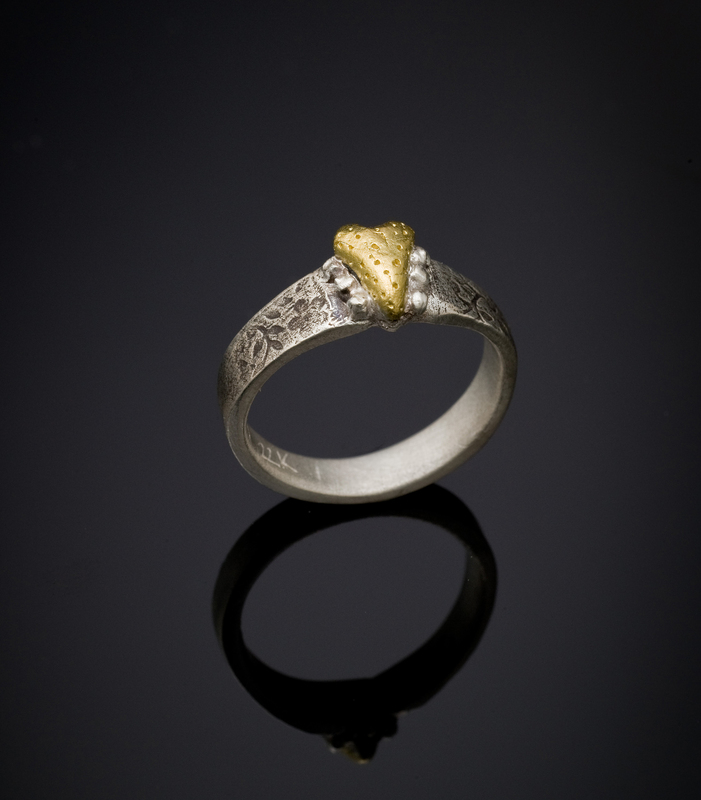 Another new piece to show you…this time it’s the Pitted Heart in 22K gold on an Oxidized fine silver band. Enjoy! This entry was posted on May 14, 2010 at 8:17 pm and is filed under Uncategorized. You can follow any responses to this entry through the RSS 2.0 feed. You can leave a response, or trackback from your own site. Pitted heart in 22K gold on silver band. On your website. I am interested perhaps in purchasing one of these rings. I probably saw it at your display at the Audubon Portland Wild Arts Festival today, but was dazzled by all of the lovely items you had for guests to look at. I am so thrilled with my sterling ring evocative of the windows/doors of pueblo dwellings from the southwest.Can you tell me what the purchase price for the pitted heart gold/sterling ring would be? I am in Portland.